Time to start stocking up on pretty fall colors. Owyhee jasper is a local stone from northwest Oregon. It has been a very popular souvenir with folks visiting our area. Here I have combined it with various shades of beautiful browns, golds, rusts and copper. 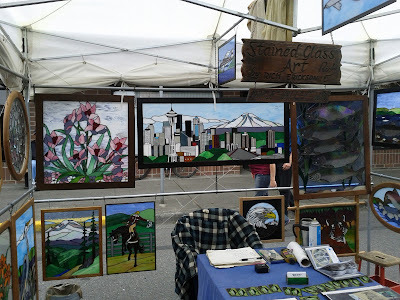 After a very disappointing trip to the Puget Sound Bead Festival in Tacoma on Sunday (I did not spend a cent!) I decided to practice what I preach and shop local. Today I stopped into Echo Artworks in Bremerton to stock up on fall (ie: green and brown) seed beads and some stones. 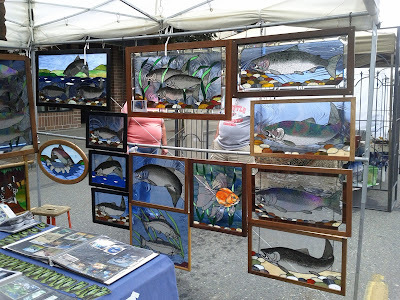 Echo Artworks is a small shop chock full of beady treasures. Owner Beth Shea and her staff are ready to help you find exactly what you are looking for. These small gemstones will be used to make more of my new gemstone bracelets (top center). Going counter clockwise from the left corner are assorted faceted gemstones, amethyst, moss agate, labradorite, garnet, ocean jasper, more garnet and moonstones. Oh my these are gorgeous!! I saw these the last time I was in the shop and promised myself I would get some the next time I stopped in. These beauties are snakeskin jasper and will make some amazing pendants. I used up many of the seed beads I bought last time I was in the shop. Luckily there were still some of the same colors left so I got all the rest! And my main reason for stopping today was to stock up on fall color seed beads. I am already using some in some owyhee jasper necklaces that are laid out on my workbench. Pictures of all my new creations will be posted in the next few weeks so stay tuned! 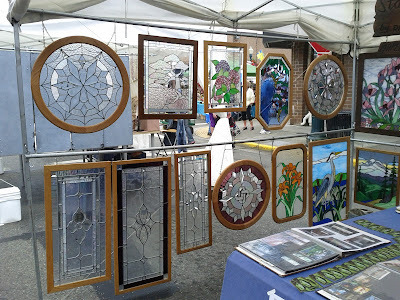 There is a photographer that frequents the waterfront, where you will often find Beadware in the summer, whose pictures I am very drawn to. They are pictures of Seattle that look like they could be watercolors. This past Friday the artist, Doug Tostenson, presented me with a copy of his book, "Seattle....Where I See It". It is a collection of his photographs that take you on an artistic journey through the streets of Seattle. His photographic style is described as high-contrast, painterly and otherworldly. Visit his website to view more of his Seattle collection and to view scenes from New York and Hawaii. You can also learn where to see and purchase his book and individual prints. Thanks for the book Doug! These draw so much attention in my booth. On a pretty day I often hang them along the back to send rainbows over my displays. I find them very hard to photograph!! They are made using crystal seed beads, small Swarovski and Czech crystals and antique leaded glass crystal from old chandeliers. Every year it seems a different color is popular in earrings. This has been blue, black and clear. Here are a few new pairs to add to the collection. The grey are beautiful smokey crystals. They really sparkle in the light. 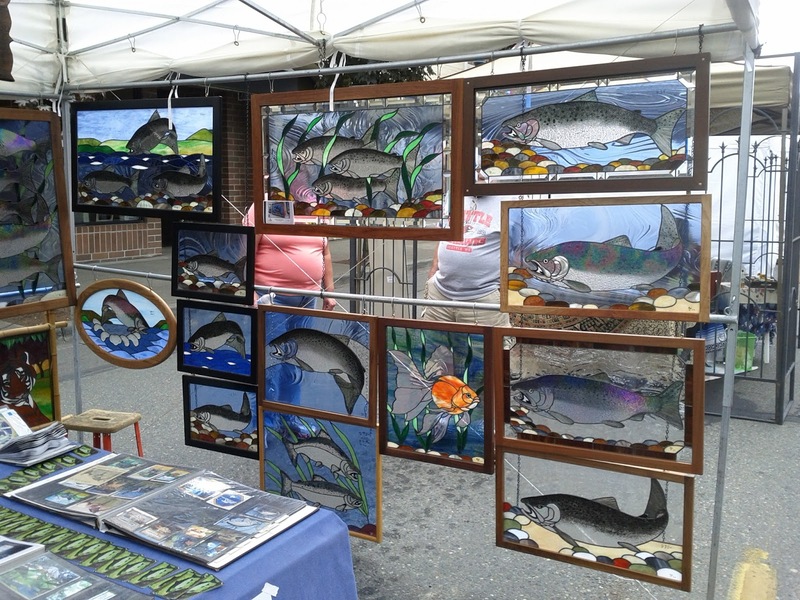 Last weekend at the Sumner Art Fest my neighbor was Rich of Rich's Stained Glass Art Originals. His tent was filled with gorgeous flat stained glass panels. The Seattle skyline is amazing! He has won various awards for his beautiful fish. Recent Work: A collection of small and pretty agates. The one on the left is gorgeous! !Both have SOLD. I have quite a few more in this fun shape! Both have SOLD. This is such a beautiful stone. Green Opal, also know as Australian or Petrified Green Opal, is a birthstone for October. It is said that this stone aids in visualization, imagination, dreams and healing. Sold. This stone is the matrix that gemstone opals are found in. When you hold this stone up to the light you might see a glimmer of gemstone opal within. it. I like to mix it with warm fall colors, coppers and greens to bring out the beauty within the stones. SOLD.